The best breakfast in Mysore is the breakfast had in Mylari Hotel. If you are new to the city, you have to try it here at least once. Chances are that you will eat more than one masala dosas. Imagine this, one fine morning, you eat three Mylari Masala Dosas and hit the bed again for after breakfast relaxation. Later, you wake up in the afternoon for the lunch in one of the best restaurants in Mysuru. This is how I like to spend the weekend in this beautiful city! I am talking about the Mylari restaurant in the old Nazarbad area of Mysuru. In fact, there are two in this block with the same name. I am referring to the one in the right when you approach from Nazarbad police station. I will visit the restaurant towards the left shortly. As far as I know, there are four restaurants with the name “Mylari Hotel”, two in Nazarbad, one in Agrahara and another one in Kuvempunagar. Please wait until I post about my food experiences in all these four restaurants. Recently I saw one restaurant opened in the Mysore-Bangalore highway and I assume it is not functioning now. If you think there is more to the list, please comment or WhatsApp me and I shall plan a visit. I know about this restaurant since more than two decades and have come here several times. Not even once, I felt bored about eating here. The Mylari Masala Dosa is crispy, soft, tasty, and different when compared with other restaurants. The masala inside the Dosa, a mixed vegetable cooked to the perfection, is different from what you get elsewhere. The coconut chutney that accompanies the Dosa is also unique to the restaurant. I was here by 8.30 am and fortunately found a place in the already crowded restaurant. The supplier took my orders swiftly and within few minutes, the hot delicious Masala Dosa was on my table. I did not wait for the butter to melt; I spread it with my finger and started eating. With the last bite on my plate, another Dosa came in and I finished it too in no time. 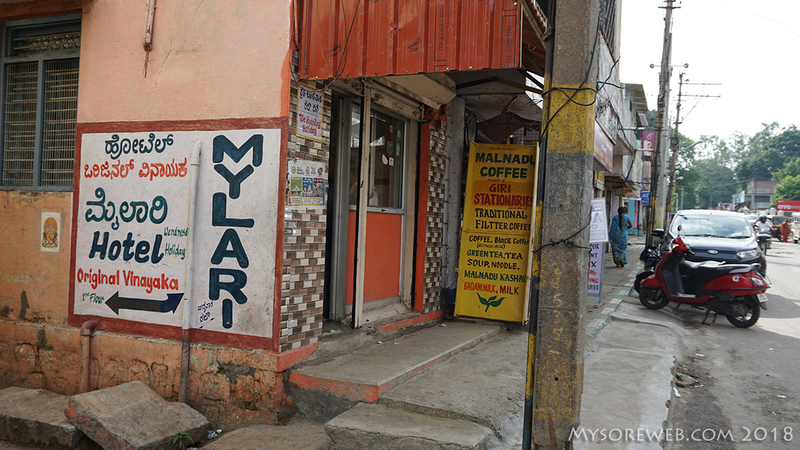 The Mylari is a smallest restaurant in Mysore that does a big business. The menus are limited but have a loyal customer base and its popularity has spread by word of mouth. The reviews have always been positive on both paper and digital Medias. The best time to visit the Mylari hotel is early morning and as the time passes, the crowd increases. The restaurant may close before 11 am. After your breakfast, you can head to the Chamundi Hills or the Zoo Garden that is nearby. I had been to the St Philomena’s church and the Kote Anjaneya temple before coming to the Mylari Restaurant.